The weather is starting to warm up and that means it’s time to dust off the grill and fire it up! I’m starting to grill at least once or twice a week but in another month or two I will be back at it full steam cooking a majority of our dinners on the grill. My friends at Smithfield® provide Real fresh ingredients. Real flavorful solutions for real life. Let’s face it–dinner time can be a struggle at times. 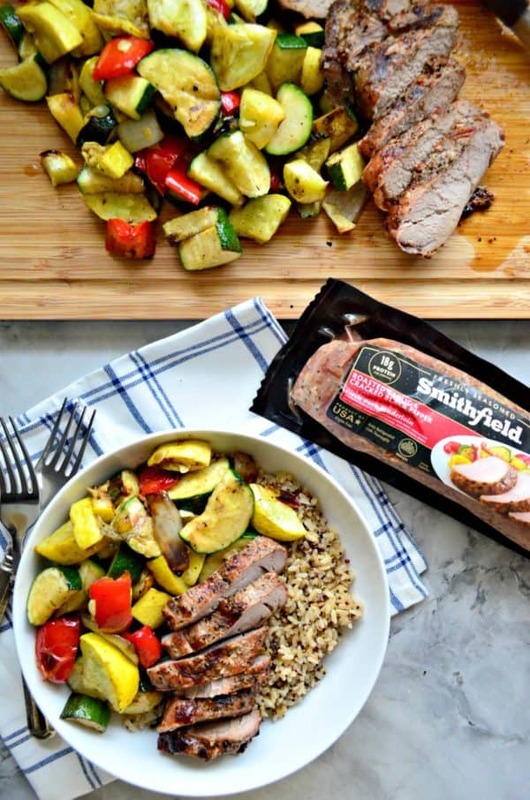 I love that Smithfield Marinated Fresh Pork comes in a wide variety of flavors helping you place dinner on the table quickly. No need to marinate meat–they do the work for you with all-natural ingredients. They use ingredients that you can pronounce; pork broth, vinegar, salt and spices! Let’s talk about my recipe for Roasted Garlic & Cracked Black Pepper Pork Tenderloin Brown Rice & Veggie Bowls. It’s a quick and healthy dinner made in 30-ish minutes. A quick chop of vegetables in season like squash, bell peppers, and onions go into a veggie basket. 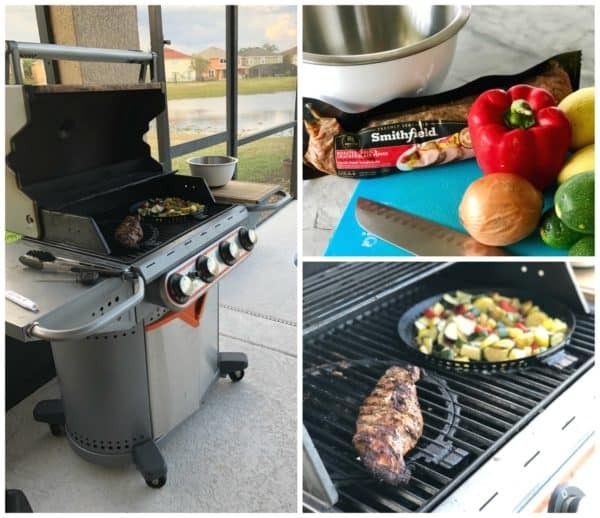 All you have to do to cook the Smithfield Roasted Garlic & Cracked Black Pepper Fresh Pork Tenderloin is cut the wrapper and place it on the grill! I cooked the pork tenderloin for 30 minutes, flipping every 10 minutes. While the pork and vegetables cooked on the grill. I heated some brown rice with quinoa. You can find them in pouches or you can make a big batch. Stay tuned later this week I’ll be sharing with you my super simple Instant Pot Brown Rice with Quinoa recipe. I had some leftover from a previous meal so that’s what I made. You might be wondering where you can find Smithfield Marinated Fresh Pork. Check out your local Walmart. Through the month of April, Smithfield Marinated Fresh Pork Filets are on rollback. 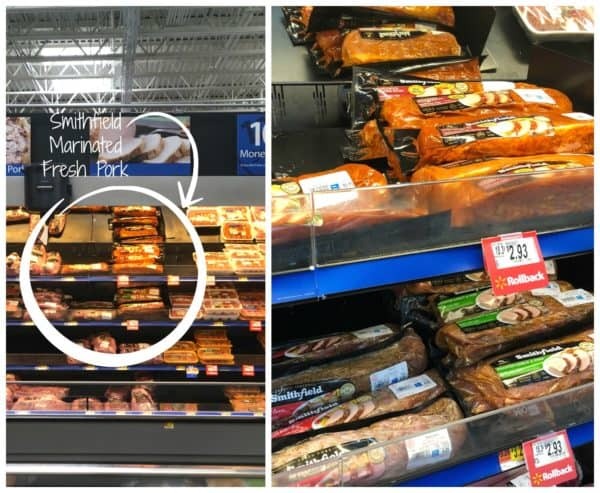 So whether your in need of an easy weeknight dinner or entertaining you can grab fresh pork at your local Walmart. If your in a dinner rut and want to change up dinner I invite you to try my easy and healthy recipe for Roasted Garlic & Cracked Black Pepper Pork Tenderloin Brown Rice Quinoa & Veggie Bowls. Very few dishes to have to clean and satisfies the bellies of all ages. Looking for more ideas? Check out these Smithfield Meal Ideas. While the grill heats, begin to prep the vegetables. Wash, slice, dice and place vegetables in the bowl leaving the onions until last. Once all the veggies are chopped and in the bowl, drizzle with olive oil and sprinkle salt, black pepper, and garlic powder on top. Toss and set to the side. Clean the grill, reduce the heat to low heat, and spray with cooking spray. Then place the vegetables in a basket. Carefully remove the Smithfield Roasted Garlic & Cracked Black Pepper Fresh Pork Tenderloin from the packaging and place on the grill. Grill for 10 minutes, then mix vegetables and turn the pork. Repeat this two more times until the internal temperature of the Smithfield Roasted Garlic & Cracked Black Pepper Fresh Pork Tenderloin reads 160 degrees Fahrenheit. Heat the brown rice with quinoa while the food cooks on the grill. Let the Smithfield Roasted Garlic & Cracked Black Pepper Fresh Pork Tenderloin rest for a few minutes. Then slice. 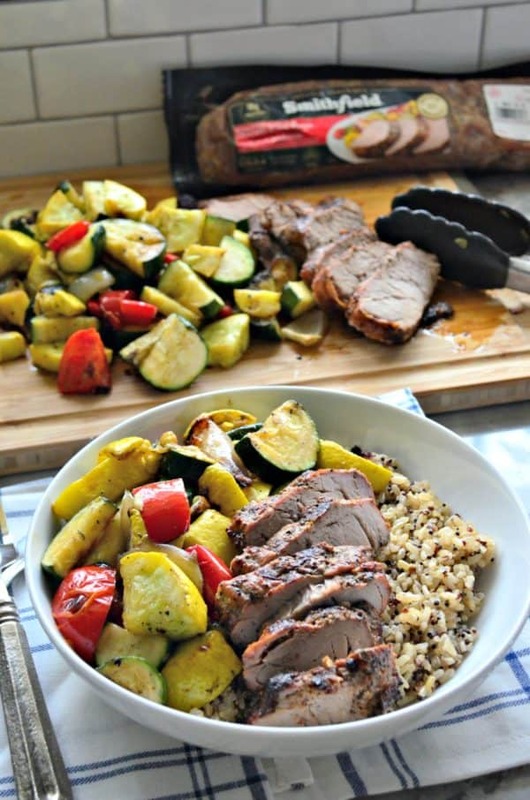 Arrange bowls with brown rice and quinoa, grilled vegetables and slices of Smithfield Roasted Garlic & Cracked Black Pepper Fresh Pork Tenderloin. Enjoy. This looks so delicious and easy. Once again your blog has been a very helpful inspiration! It’s now on our menu for tomorrow – THANKS! Thank you–it’s so good! Hope you like it as much as we do! All those veggies!! I love grilled veggies!